despite it being rejected by the Opera House chief executive Louise Herron. The anger is centred around the Everest Cup’s links to gambling, which will be promoted during Responsible Gambling Awareness Week and Alan Jones’ role in the incident. Last night The Chaser made a jab at the influence many criticise Jones had in the decision, creating their own sign which included the radio host’s telephone number. This morning the radio host apologised to Herron after he was accused of bullying her in a Friday interview, calling for her to be sacked. However, he maintains his behaviour was not bullying. "To Louise and those people who've been offended, I apologise," Jones said this morning on his 2GB breakfast program. “As I said earlier, I'll be writing to Louise later today and indicate those very same sentiments." In addition to the sign by The Chaser a petition is being delivered to NSW Parliament. Started on Change.org, it currently has over 260,000 signatures and is rapidly growing. AdNews asked advertisers, outdoors and agencies to share their views on the Opera House advertising saga. Read more here. The Chasers projected a sign with Jones' telephone number on the Opera House. 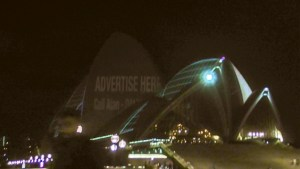 The Chaser boys have projected an “Advertise Here, Call Alan” sign on the Sydney Opera House as the backlash continues over the decision to allow The Everest Cup to advertise on the landmark. The move from the comedy group follows the decision by the NSW Government to back radio host Alan Jones’ call to use the Opera House as a billboard, despite it being rejected by the Opera House chief executive Louise Herron. Should the Opera House be open to advertisers?